WiZdoms from the Football Field! NY Jets cornerback, Buster Skrine joins Deidre and JG to discuss recovering from setbacks. 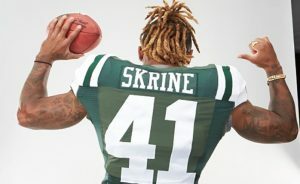 This week’s episode of GutwiZdom features NY Jets cornerback, Buster Skrine who was in studio with Deidre and JG to chat about staying positive when faced with disappointments and recovering from setbacks. Listen to our podcast to hear what Buster has to say, but that’s not the only place you can find his “wiZdoms”! Visit www.busterskrine.com to find out all about Buster and his charity events! Believe! Believing in yourself and believing in the others on your team are equally important. If you don’t believe in yourself who else will believe in you? Positivity! To prepare yourself for whatever comes next, move on and put the disappointment behind you. Family! Rely on your family when times are tough. Find true friends who will always have your back. Trust! Trust your teammates and trust your gut! It will never let you down. Prepare! Having a routine keeps your mind positive and concentrated on improving and getting better. Focus! Stay away from distractions, stick to what you know is right, and write down your goals and put them in your shoe! LISTENERS: WHAT HAS FOOTBALL TAUGHT YOU? Send us your answer. Either leave us a voicemail at 1-646-653-9278 or send us an email. We may talk about it - or we may even talk with YOU - on the air!